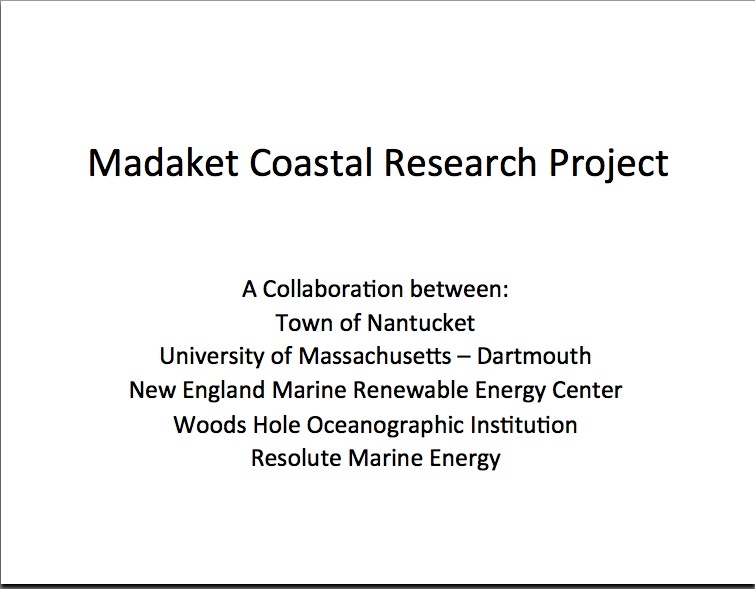 A Woods Hole Oceanographic Institute (WHOI) project, in collaboration with the Town of Nantucket, the Massachusetts Clean Energy Center (MassCEC), and the New England Marine Renewable Energy Center (MREC). This note is to update you and the town on the status of the WHOI research shed located at 6 Chicago St. in Madaket. My apologies for the delay in getting this information to you. 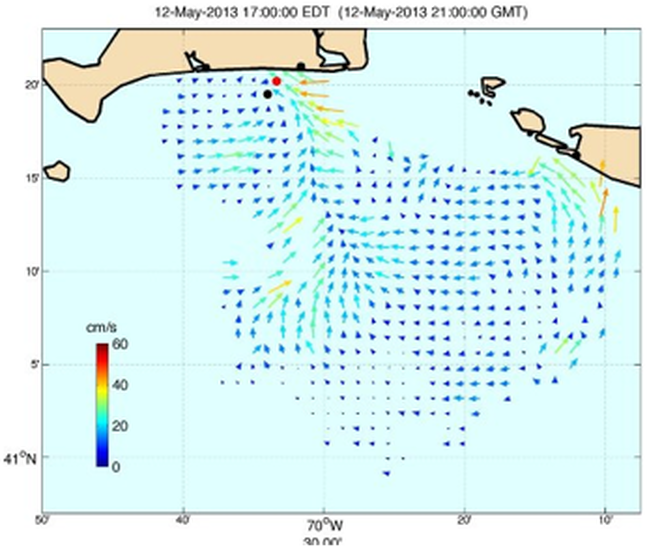 In general, my research activities related to wind and wave power research projects in the area are continuing. While the wave power demo my work was to support did not, and will not, occur, this work has led to a number of developments in our ability to remotely sense surface winds. Thus, my primary funder for these activities, the State of Massachusetts via MassCEC, has asked for a short extension to the high frequency radar sampling conducted as part of the original project. This supplemental work will be completed over the course of 2 months this fall. It is my understanding that both the HDC and Conservation permits for the project will end in spring 2015, 3 years from the start of the permit process. However, I plan to vacate the site on or before January 2015.
offices to explore this possibility. This project aimed to install an oceanographic sensor at Chicago St. adjacent to Madaket Beach on Nantucket that would enable remotely sensed observations of the sea surface at ranges up to 30 miles away from the site. Combining the results from this sensor with similar units already operating on Martha’s Vineyard, the system would be able to collect observations of currents, waves, and winds in the coastal ocean south of Nantucket and Martha's Vineyard. 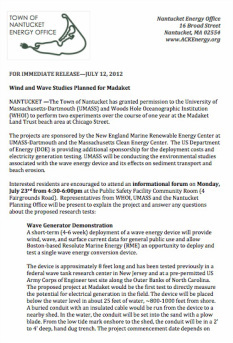 This work was funded by the Clean Energy Center (MassCEC) via the New England Marine Renewable Energy Center (MREC), in partnership with the Town of Nantucket to research wave and wind data products and support a wave power demonstration project. The figure shown here illustrates an example of the data return from May 13th, 2013. While images are available via the MVCO website, a more user-friendly web interface is being designed within WHOI graphics, which will include webcam images from cameras installed at Madaket (see sample image from 5/13/2013 below) as well as the other radar locations on Martha’s Vineyard. Web cam view of Madaket Beach from the WHOI shed off Chicago St. The wave power demonstration portion of the project has been delayed indefinitely, due to a change in direction by Resolute Marine, the company that was to test their paddle generator at the Madaket site. It is unlikely that a similar demonstration will occur during the permitted period. 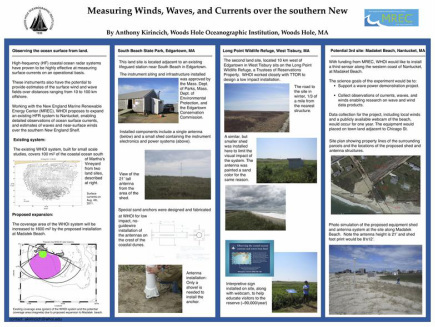 However, work on advanced wave and wind data products used the data from the WHOI instruments placed at the Madaket site has shown initial success. Thus, the site - as it exists today - will continue to be operated for the coming year. During this time, the data collected from the Madaket site will be utilized by a number of research projects led by WHOI scientists. These include additional efforts to understand the instrument’s abilities to sense wind speed and direction over the full domain covered by the combined systems, and an intensive study funded by the National Science Foundation to understand the role of small scale features in the coastal ocean such as as squirts, jets, and eddies on the exchange of water, nutrients, pollutants, and sediment between the surf zone onshore and the larger coastal ocean offshore. Additionally, the observations collected by the Madaket system will be reported to national data centers ran by NOAA to aid NOAA managers in predictions of ocean weather, oil spill trajectories, etc. for the coming year. Town of Nantucket's HDC Application (includes photosims).